On Wednesday, March 20, Waterford participated in National History Day. Without exception, students stretched themselves this semester, with amazing results. Waterford's eighth grade class, across four sections and two different teachers, created 50 fine projects that made me exceptionally proud. Because of the number of schools participating in history fair in our region, we unfortunately were not allowed to bring all 50 projects to the regional fair. We narrowed the projects down to 18 projects across nine categories in the junior division through a Waterford School fair, which was held on February 15. Two additional projects in the senior division were submitted and sent to regionals. 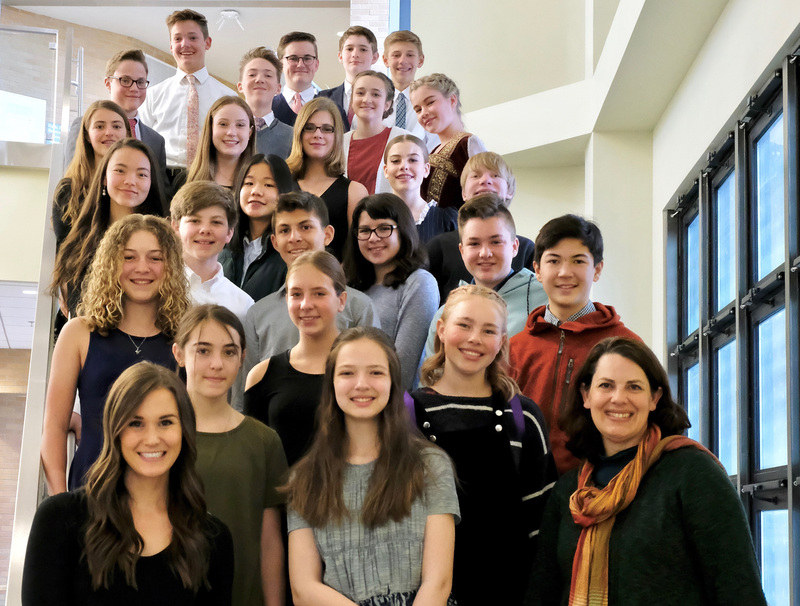 The 30 students who made those projects took part in the regional National History Day contest that determines who will represent Salt Lake Valley schools at the state tournament on April 26. A total of 158 junior division projects were brought to the tournament from around the valley, competing for 27 spots. All of our Waterford students performed wonderfully. They were dressed professionally, articulate with their explanations, courteous to others and enthusiastic about their topics. In the end, twelve of our junior division projects were chosen to move forward to state. Both of our senior division projects were chosen to go forward to state as well. Having 14 of our 20 projects are moving on to State is a remarkable accomplishment, and Waterford students won nearly half of the awards in the middle school category. The results shows a great deal of hard work and attention to detail among our students. Spencer C., Owen H., Diesel K.
Adi J. and Kenna M.
Jacob O. and Sam R.
Mathew N., Eli W., Kaden J. There were also brilliant, thoughtful projects among those that did not move on, created by Avery Kelly, Emma Stout, William Marshall, Will Mortenson, Garrison Heuston, Raquel Passey, McKenzie Snow, and Lisa Duncan. We are so proud of ALL of our students who put in a huge amount of work on their projects. Thank you all for your support and dedication to learning. Kristin Hacken South earned her bachelor's and master's degrees in Near Eastern Languages and Civilizations, with an emphasis on ancient Egypt, at Yale University. She has worked on archaeological sites in Jordan and Syria in addition to her ongoing work in Egypt at an early Christian necropolis. She returns to Egypt every year or two as a member of Brigham Young University's excavation team to continue work at that site. She has published multiple academic papers and presented at three international conferences pertaining to her specialty of archaeological textiles of the first millennium CE in the eastern Mediterranean. All three of Ms. South's sons have had at least two years of Waterford education. Her youngest is currently a student in the Upper School, and her husband was a member of Waterford's second-ever graduating class of 1988. She has taught at the School since 2014. In addition to her assignments as a history teacher, Ms. South enjoys time in the Lower School as the chess specialist, where she teaches chess to the third through fifth graders, runs the after-school tournament team, and takes students to chess tournaments.